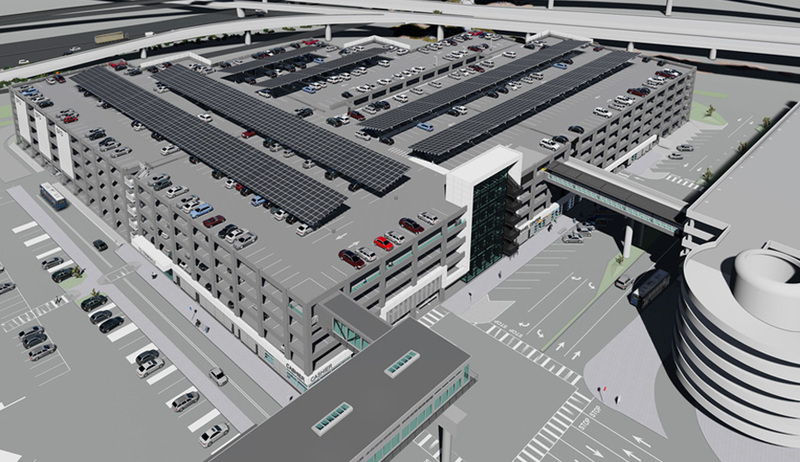 As part of the Master Plan to expand San Francisco International Airport (SFO) to meet anticipated increases in demand, the San Francisco Airport Authority intended to significantly expand its off-site long-term parking facilities and extend the AirTrain people mover system to the expanded long-term parking facilities to form a multimodal center. The proposed Long Term Parking Garage No. 2 will be a 6-story structures to be located northwest of an existing long term parking garage and surface parking lot. The project is designed to provide a parking structure with world-class functionality for vehicles and pedestrian traffic. The facility will have capacity of 3,500 gross stalls for long-term parking, and will include infrastructure for future 100% EV charging, with 3% of the parking stalls providing EV charging stations at the facility’s opening. CHS Consulting Group is currently part of the design-build team. Our work began with estimation of travel demand to assess varying solutions for site circulation plan; in-bound and outbound lanes for the existing and future parking structures and surface lots; entry and exit locations and number of access gates; and number of lanes for the access driveway. CHS staff has conducted AutoTURN studies and supplied concept plans for remaining portions of the site including extension of AirTrain and United Airlines Maintenance Facility Staff Parking. CHS has prepared the Basis of Design and completed the Construction Document Trade Package for the temporary routing of SFO shuttle buses and passenger cars while the site for the new structure is under grading, utility relocation, and construction. CHS is currently participating in the Design Development stage for the final configuration of the entire site. CHS will provide construction staging to maintain circulation and access to the existing structure and surface lot while the remainder of the project, including the new entry/exit gates, are constructed.